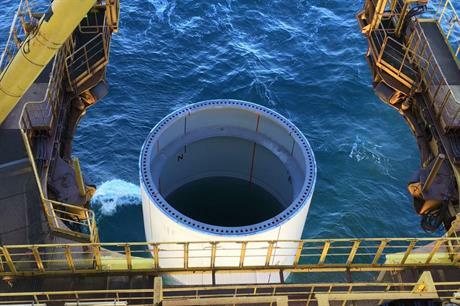 UK: The installation of the first monopile at the 1.2GW Hornsea Project One site has taken place off the UK's east coast. The Ørsted site is located in the North Sea 120km off England's east coast and will be the largest capacity offshore wind project in the world when completed in 2020. The site will comprise 174 Siemens Gamesa SWT-7.0-154 turbines. The first monopile foundation, produced by EEW, was installed by GeoSea's Innovation installation vessel. The vessel can install four 65-metre long, 8.1-metre diameter steel foundations at a time. Duncan Clark, Ørsted's programme director for the project, said: "After years of planning it is fantastic to see the initial stages of offshore construction begin. "Onshore, we are continuing to construct the east coast hub, which will serve as an operations and maintenance base for our existing wind farms in the area, and both Hornsea Project One and Project Two, which we took a final investment decision on last year." The 1.4GW Hornsea Project Two will be installed next to the Project One site.